One of the professed goals of the coalition has been to ‘rebalance’ the UK economy away from debt-fuelled domestic consumption and into export-led growth. Yet there is growing evidence that, in spite of a recent increase in growth and employment, the government is failing to deliver what was promised. Rates of investment remain low; household debt is rising once again; and pay in manufacturing continues to slip behind financial services. It didn’t have to be like this. Indeed, in many ways the post-2008 context has provided the ideal circumstances to re-orientate the British growth model towards exports – primarily because sterling has deteriorated in value (at least partly by design). However, research released by SPERI today demonstrates a spectacular (and, in the post-war era, unprecedented) failure in this regard. The report shows that, partly as a result of the policy of ‘quantitative easing’, sterling has undergone a significant depreciation over the past few years. Normally, this would result in a significant improvement of the trade balance. This is because a currency devaluation makes export goods cheaper abroad, giving that country’s exporters an advantage against competitors. Conversely, devaluation makes it more expensive to import goods (with a by-product of boosting domestic production). This should lead to an overall improvement in the balance of trade – the difference between the goods and services that a country imports and exports. If we look back on previous depreciations of the pound, we can see that this did indeed take place. For example, in 1976, sterling depreciated by 19.2 per cent against the dollar and 25 per cent against the Deutschemark. In the following two years, the UK trade balance improved by an annual average of 161 per cent, followed by 153 per cent for the subsequent two years. These changes in the trade balance represented a significant improvement on the trend evident in the four years prior to depreciation. Similarly in the early 1990s, following the UK’s withdrawal from the European Exchange Rate Mechanism, the pound again depreciated – against the Deutschemark by 15.4 per cent and against the dollar by 10.9 per cent. In the following two years, the UK trade balance improved by an annual average of 162 per cent, followed by 96 per cent for the subsequent two years. One might expect that a comparable devaluation in 2008 would yield a similar improvement in the balance of trade. However, SPERI’s research demonstrates that in spite of a large sterling depreciation throughout the financial crisis of 2008 – of 15.4 per cent against the euro and 24.4 per cent against the dollar – we have not seen a marked improvement in the country’s trade balance. 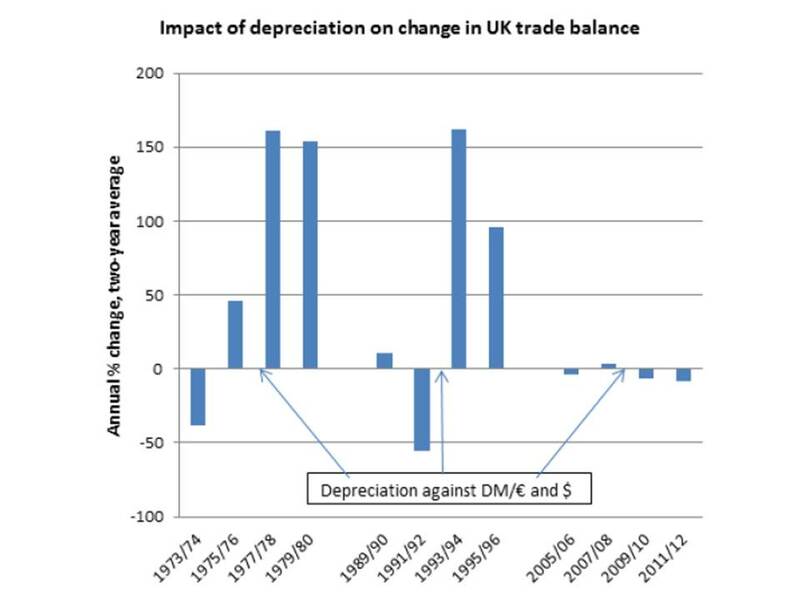 Indeed, the UK trade balance deteriorated by an annual average of 6 per cent in the two years following devaluation, followed by 8 per cent for the subsequent two years. This suggests that the problems facing the British economy are deeply entrenched. Some commentators would point to difficulties in the Eurozone as a key factor explaining the absence of an improvement to the British balance of trade in spite of a favourable currency position. The euro has indeed been devalued, and aggregate demand is considerably constrained across Europe. Since a large proportion of our exports go to European markets, some would claim that it should come as little surprise that devaluation has not resulted in a turnaround in our trade position. However, two points can be made against this argument. Firstly, despite some signs of competitive devaluation, sterling has remained under-valued against the euro, such that, by the end of 2013, it was still 15.8 per cent down against the euro compared to its value in 2007. While both currencies have simultaneously devalued, institutional and political constraints have prevented the Eurozone countries from engaging in a comparable devaluation to that of the UK. Secondly, the UK’s failure to benefit from devaluation is in part due to its over-reliance on exporting business and financial services to Europe. If the ambition of export-led growth is really to be achieved, it requires a considerable diversification of the UK export base, not least a resurgence of manufacturing exports. In this regard, the UK compares unfavourably when we contrast its export performance with leading economies from the continent. For example, partly as a response to deflation in the Eurozone, Germany has been re-orientating its exports towards emerging markets, particularly China. The UK, on the other hand, has not managed any such shift: we continue to export more to the crisis-afflicted ‘PIIGS’ countries than to all of the BRICs combined! Depreciation could, and should, have aided a significant re-orientation towards these emerging markets, but the underlying weakness of the UK manufacturing base has proved to be a significant handicap. We can conclude that quantitative easing and ‘loose’ monetary policy have not been successful in boosting UK export performance. Rather than helping to address the trade deficit, the policy has merely served to boost asset-prices and pump liquidity into a financial system that continues to withhold investment from the real economy. Improving the trade balance will require more than central-bank-mandated asset-price inflation. We need to go beyond monetary policy and think through what institutional and political changes are needed to reverse the decline of UK manufacturing and the balance of trade problems that go with it. A version of this post originally appeared on Left Foot Forward.